Generous support from the Yale Gordon Trust through the Jewish Chautauqua Society supports the teaching of courses in Jewish studies at St. Mary’s Ecumenical Institute. This lectureship for courses in Hebrew Bible and language honors the memory of Rev. Dr. A. Vanlier (“Van”) Hunter and was endowed by his students, friends, and colleagues. A distinguished churchman and a professor at St. Mary’s for 20 years, Van was Associate Dean of St. Mary’s Ecumenical Institute until his death in 1992. The St. Mary’s Ecumenical Institute Endowment Fund supports the appointments of distinguished faculty lecturers annually. Recipients of these awards are honored for outstanding teaching and contributions to the academic program of St. Mary’s Ecumenical Institute. The fund also provides for several permanent distinguished lecturers. Currently, Dr. Stephen Vicchio, Rev. Dr. Tony Hunt, and Dr. Pat Fosarelli are the permanent distinguished lecturers. 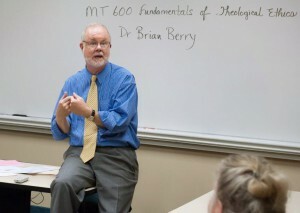 Past permanent Dunning Lecturers include Dr. Brian Berry, the late Fr. Philip Keane, P.S.S., and the late Dr. Olin Moyd.